You’d think plain old vegetable juice wouldn’t need dead animals in it, but apparently, Campbell’s thinks it does. Food Babe just revealed that Campbell’s has confirmed that their V8 Juice IS NOT vegan and that V8 natural “flavoring” may include “meat/seafood/poultry/dairy.” The source of Campbell’s V8 “Natural Flavor” was offered up on a Twitter Q&A along with a confirmation that Campbell’s does not currently offer any 100% official vegan products, which, as Food Babe points out, means that the “100% Vegetable Juice” claim on the label of V8 is totally false. This isn’t the first time Campbell’s has been accused of sneaky substances in their food products, but people seem extra irked by this issue considering it’s flipping tomato juice – why does it need animal flavoring? Like V8, but don’t like Campbell’s deceptive ingredients? Visit Food Babe to get a recipe for homemade vegan tomato juice and sign this soon-to-be-sent-to-Campbell’s petition – Stop sneaking animal products in our V8 and soup. + Source: There Might Be Dead Animal Parts in Your V8! Campbell's Says V8 "100% Vegetable Juice" May Contain "meat/seafood/poultry/dairy"
You'd think plain old vegetable juice wouldn't need dead animals in it, but apparently, Campbell's thinks it does. Food Babe just revealed that Campbell�s has confirmed that their V8 Juice IS NOT vegan and that V8 natural �flavoring� may include �meat/seafood/poultry/dairy.� The source of Campbell's V8 �Natural Flavor� was offered up on a Twitter Q&A along with a confirmation that Campbell's does not currently offer any 100% official vegan products, which, as Food Babe points out, means that the �100% Vegetable Juice� claim on the label of V8 is totally false. 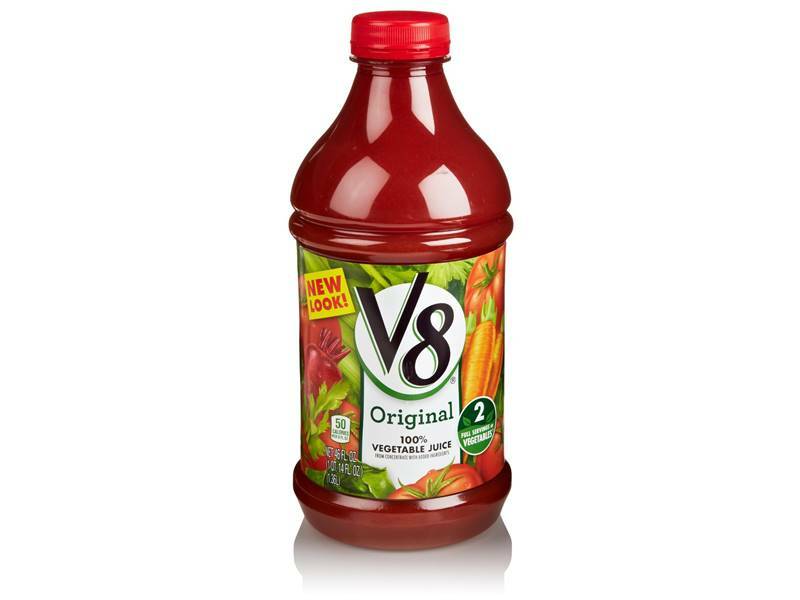 This isn't the first time Campbell's has been accused of sneaky substances in their food products, but people seem extra irked by this issue considering it's flipping tomato juice - why does it need animal flavoring?�Like V8, but don't like Campbell's deceptive ingredients? Visit Food Babe to get a recipe for homemade vegan tomato juice and sign this soon-to-be-sent-to-Campbell's petition - Stop sneaking animal products in our V8 and soup.